This is a house truck that you have to see to believe. Completely road legal, this off-the-grid house truck folds out and transforms into a fantasy castle. 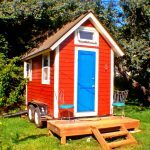 This is one Tiny House tour you don't want to miss! Tiny House With Two Sleeping Lofts!